Does the Mediterranean diet lead to a better health? Nutritional studies show it does. The Mediterranean diet has been around for a while. It was first advocated by Ancel Keys who became interested in data which showed that American business executives who were thought to be the best fed in the world had higher rates of heart disease than people living in post war Europe where the food supplies were limited. In 1950s / 60s he conducted his Seven Countries Study which for the first time objectively showed that the Mediterranean diet is healthier than other diets. He concluded that saturated fats found in milk and meat have adverse effects on the health while unsaturated fats found in e.g. olive oil had beneficial effects on health. However it was not until 1990s when Dr Walter Willett presented his version of the Mediterranean diet based on the typical food patterns of Crete, the rest of Greece and Southern Italy that this diet gained widespread recognition. Over the years the Mediterranean diet has been linked to many health benefits including: longer life span, lowering the risk of heart disease, lowering the risk of high blood pressure, preventing elevated ‘bad’ cholesterol, helping to fight certain cancers and protecting from type 2 diabetes, Alzheimer’s and Parkinson’s just to name a few. The most recent study published in The New England Journal of Medicine concluded that for people with high cardiovascular risk, eating the Mediterranean diet supplemented by extra virgin olive oil and nuts reduced the incidence of cardiovascular events by 30%. Another recent study published in American Journal of Clinical Nutrition concluded that the Mediterranean diet is effective in improving various markers of cardiovascular risk in people with diabetes and should be used in the overall diabetes management. In addition to the health benefits, the Mediterranean diet has three additional advantages over other diets. Firstly you are probably already eating some or all of these foods and tweaking what you eat by making slow and gradual changes for example by substituting red meat for fish will lead to a better health. Secondly the Mediterranean diet can be really easily adopted to fit any family meals. There are some good recipes and inspiration on putting together tasty mediterranean meals on eatingwell.com. My favourite is the Salmon Panzanella. 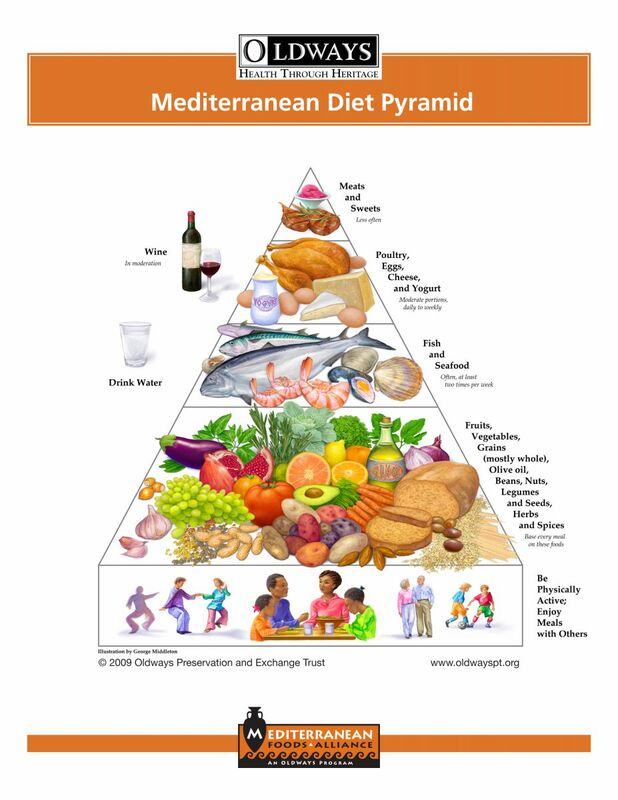 Thirdly although the Mediterranean diet restricts eating of certain foods it still offers a lot of choice. So for example if you are allergic to seafood or just not a big fan of fish you can get your omega-3s and protein from nuts and legumes. However it is not just the diet that is important. The lifestyle plays an important part too. In addition to the regional specific diet, people living in the Mediterranean region also led physically active lives where walking rather than driving was part of the daily routine. Although it is not possible for us to walk everywhere all the time, it is important to keep active every day or at least several times a week by for example, going for a walk or a hike, choosing the bike whenever possible or going to the gym. What do you think – are there aspects of your diet that you can make more Mediterranean? Tags: American Journal of Clinical Nutrition, Ancel Keys, Cardiovascular disease, Mediterranean, Mediterranean diet, Mediterranean Sea, Olive oil, Walter Willett | Permalink.